Humpbacks feast on a billion sardines! The risks currently being experienced across the planet. Most, if not all, are set to increase. Regional changes in the physical system and associated risks for natural and human-managed systems. Source: Science; Gattuso et al. (2015) modified from IPCC WGII AR5 (2014). Time is rapidly running out for the world’s oceans and the creatures that live in them as the Earth’s climate continues to warm, say scientists. Only “immediate and substantial” reductions in greenhouse gas emissions can hope to prevent “massive” impacts on marine ecosystems, warn the experts. Researchers compared the fate of the oceans under two scenarios, one a “business-as-usual” approach and the other involving drastic cuts in emissions. Their analysis showed that business-as-usual would have an enormous and “effectively irreversible” impact on ocean ecosystems and the services they provide, such as fisheries, by 2100. Even after curbing emissions of carbon dioxide (CO2) enough to prevent temperatures rising by more than 2C compared with pre-industrial levels, many marine ecosystems would still suffer significantly, they said. The international team led by Dr Jean-Pierre Gattuso, from the Laboratoire d’Océanographie de Villefranche in France, wrote in the journal Science: “Impacts on key marine and coastal organisms, ecosystems, and services from anthropogenic (man-made) CO2 emissions are already detectable, and several will face high risk of impacts well before 2100, even with the stringent CO2 emissions scenario. Any new global climate agreement that fails to minimise the impact on oceans will be “incomplete and inadequate”, stressed the scientists. The findings are intended to inform the forthcoming 2015 United Nations climate change conference in Paris. By 2050, the loss of critical habitats such as coral reefs and mangroves was expected to contribute to “substantial declines” for tropical fisheries, on which many human communities depended, said the researchers. This was the case even under the 2C emission cutting scenario. While Arctic fisheries may benefit from warmer temperatures at first, the scientists pointed out that this region was a “hot spot” of ocean acidification. It also contained communities that were highly reliant on the sea. Acidification, warmer oceans, sea level rise threaten the all marine ecosystems...in that video, the Ocean Initiative 2015 Project provides straightforward answers to this issue. 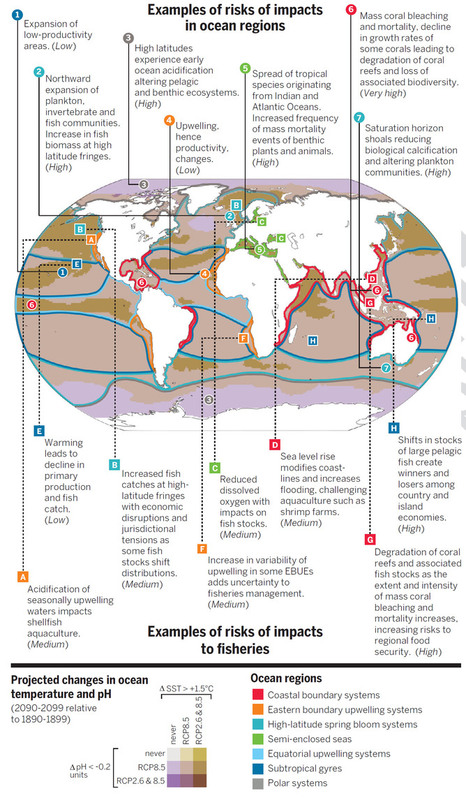 A new paper just published in Science summarizes the projected impacts of climate change on the world’s oceans, and consequently on humans and our economy. The study concludes that global warming beyond the international limit of 2°C above pre-industrial temperatures would pose serious threats to marine ecosystems and their millions of human dependents. It builds on the consensus science published by the Intergovernmental Panel on Climate Change last year. Ocean changes associated with a 2°C warming of global surface temperature carries high risks of impacts and should not be exceeded. The oceans have absorbed over 90% of the excess heat and 28% of the carbon pollution generated by human consumption of fossil fuels. As the authors of the paper note, in many regions, the ocean plays an important role in the livelihood and food supply of human populations. The ocean represents more than 90% of the Earth’s habitable space, hosts 25% of eukaryotic species, provides 11% of global animal protein consumed by humans, protects coastlines, and more. A major report warns that life in the seas will be irreversibly changed unless CO2 emissions from industrial society are drastically cut. Twenty-two experts in the journal Science say the oceans are heating, losing oxygen and becoming more acidic - all in response to our carbon dioxide. The scientists in Germany have been studying an event five million years ago that could throw light on today's challenges. The study considers human impacts on the world’s oceans under two different scenarios. The first is a business-as-usual high fossil fuel consumption scenario (called RCP8.5 in the latest IPCC report), and the second is a scenario in which humans take immediate serious steps to curb fossil fuel consumption (called RCP2.6). Between now and 2100, RCP8.5 involves 6 times more global carbon pollution emitted by humans than RCP2.6. The societal effort involved in reducing fossil fuel consumption and carbon emissions to meet RCP2.6 is obviously much greater than the effort involved in the do-nothing scenario, but this study finds that the outcomes are also starkly different for the world’s oceans. In the business-as-usual scenario, by 2100 the oceans would be about 30 cm higher, oxygen content nearly 2% lower, ocean acidity 70% higher, and sea surface temperatures about 2°C hotter than in RCP2.6. In summary, the carbon that we emit today will change the Earth System irreversibly for many generations to come. The ocean’s content of carbon, acidity, and heat as well as sea level will continue to increase long after atmospheric CO2 is stabilized. These irreversible changes increase with increasing emissions, underscoring the urgency of near-term carbon emission reduction if ocean warming and acidification are to be kept at moderate levels. "Oceans - The sinks of our World": gives an example of how public engagement can make a significant contribution to scientific investigations of the effects of global warming and ocean acidification on marine life. The film introduces us to a man who has been recording the temperature of the sea in his region of the Mediterranean Sea for forty years. Now he is also collecting water samples to support scientific investigations on ocean acidification. His work is of great importance to scientists who are studying the impacts of increasing emission of CO2, driven by human fossil fuel combustion, on the temperature and chemical make- up of our oceans. Questions about the impact ocean acidification may have already caused to the health and diversity of marine life need to be answered. However, questions about how the conditions for marine organisms may change in the future also matter greatly. After all, experimental research in the laboratory and observations of marine life close to undersea volcanic vents have already shown that that calcifying organisms, such as chorals, are greatly affected by an increase of acidity in the water. The film invites the viewer to observe scientific investigations in the laboratory but more so to join scientists as they conduct their investigations at under water sites. As an example of one consequence of these changes, many marine species are shifting to different geographic regions as the oceans warm. These shifts can pose serious challenges for fisheries. Recent studies strongly reiterate that many species—including various invertebrates, commercially important fish species and marine mammals—are undergoing phenological and geographical shifts of up to 400 km per decade as a result of warming. These geographical species shifts are projected to occur about 65% faster in the business-as-usual scenario than under RCP2.6. Coral reefs are particularly sensitive to human-caused ocean changes. They provide habitat for almost a quarter of the species in the oceans. Hundreds of millions of people rely on the coastal protection, tourism, and food provided by coral reef ecosystems. However, the authors of this study note that the dual threats of global warming and ocean acidification pose a serious threat to coral reefs. Reef-building corals are extremely vulnerable to warming. Warming causes mass mortality of warm-water corals through bleaching as well as through biotic diseases, resulting in declines in coral abundance and biodiversity. Coral reefs can recover from bleaching events when thermal stress is minimal and of short duration. However, ocean warming and acidification are expected to act synergistically to push corals and coral reefs into conditions that are unfavorable for coral reef ecosystems. There is limited agreement and low confidence on the potential for corals to adapt to rapid warming. The study also estimates some of the economic impacts of ocean changes in the business-as-usual scenario. For example, lost coastal habitats and sea level rise could combine to expose 0.2 to 4.6% of the global population to inundation annually at a cost of 0.3 to 9.3% to global GDP. In terms of tourism dollars, the difference between the two scenarios amounts to about $10 billion per year, hitting Australia and the USA particularly hard. Loss of coral reefs to tourism under the RCP2.6 and RCP8.5 scenarios could cost between US$1.9 billion and US$12 billion per year, respectively. Coral reef losses due to ocean warming and acidification on the Great Barrier Reef place up to $5.7 billion and 69,000 jobs in Australia at risk. In addition, ocean acidification may cause an annual loss of reef ecosystem services that are valued up to US$1 trillion by 2100. For about a quarter of countries with reef-related tourism, mainly less developed countries, this kind of tourism accounts for more than 15% of gross domestic product and is more sustainable than extractive livelihoods. The study also makes a critical and often-overlooked point. Some people believe geoengineering is a better or more practical solution than curbing our carbon pollution. Geoengineering proposals often involve slowing global warming by reducing the amount of sunlight absorbed by the Earth, for example by pumping sulfur high into the atmosphere, or putting large mirrors into orbit. However, these proposals wouldn’t curb human carbon emissions, and hence wouldn’t slow the accumulation of carbon in the oceans, or the resulting ocean acidification. Ultimately, the authors warn that immediate action to cut carbon pollution is critical if we want to curb the rapid and dangerous impacts already being observed in the world’s oceans. …immediate and substantial reduction of CO2 emissions is required in order to prevent the massive and effectively irreversible impacts on ocean ecosystems and their services that are projected with emissions scenarios more severe than RCP2.6. Limiting emissions to below this level is necessary to meet UNFCCC’s stated objectives. Policy options that overlook CO2, such as solar radiation management and control of methane emission, will only minimize impacts of ocean warming and not those of ocean acidification. History repeats itself, and according to a new report, the same patterns that affected species extinction on land could be happening in the global oceans. Despite this trend, however, we can help shape the future of ocean life by advocating for more marine protected areas and being an informed consumer. Sea Technology spoke with Douglas McCauley, a University of California, Santa Barbara scientist who worked on the report, about what terrestrial species extinction means for marine life and the industrialization of the oceans. How many land-based species have gone extinct? In the last 500 years, there have been about 500 species of terrestrial animals that have gone extinct. There are many more that have gone extinct prior to 500 years, but some of the record keeping gets harder to do when you move back thousands of years. What we are trying to do is focus on extinctions that are driven by people. It's easier to concentrate on the past five centuries, where we know much more about what has happened to the environment. In the ocean, in the same time period, 15 animals have been lost. Why is the trend of species extinction on land important when looking at marine life? It is a way for us to get a sense of how history can inform the future. Things are basically behind in the oceans, in terms of our impact on wildlife communities, relative to our impacts on land. It seems that we run through a couple of different transitions in the way that we influence wildlife. When we look back at what happened on land, we can see how these transitions took form and what the consequences were. We started hunting animals directly. Then, we switched over to using the resources and space that animals use, hunting their homes and degrading their habitats. That transition toward moving from hunting directly to hunting the land they use happened about the time, in a serious way, of the Industrial Revolution. It was during that period where we were degrading habitats more rapidly that we also saw a major elevation in rates of terrestrial animal extinction. In the oceans, the clock is turned back. We're still hunting animals directly. What we report is that there may be early signs of going toward this same shift in the ocean. If we look at a wide range of data sources from marine industry, it seems there is a lot of new growth in development in the oceans. We are now beginning to use space in the oceans at unprecedented rates. That may be pushing us toward a period where we begin to industrialize our use of space in the oceans. You mention a marine industrial revolution. Is this shift what that refers to? The terrestrial Industrial Revolution was about building out our cities and factories and using resources from wild spaces. That seems to be what we are seeing early signs of in the ocean. We are building power plants in the oceans. We're beginning to set ourselves up to start mining in the oceans. There are more than 1 million square kilometers of seabed that have been set aside for future mining. We're beginning to farm in an almost industrial-strength way. It seems like some of the signs in these data remind us of the early days of the terrestrial Industrial Revolution. As an ecologist, that's where we get a bit worried, because we saw this explosion of growth go hand-in-hand with major extinction rates. We don’t want that to happen in the oceans. We need to be careful about where we put this industry and what rates we let it develop. In your research, how do you correlate human actions and species extinction? The nice thing is, with only 15 animal extinctions in the oceans, there is not a lot of ambiguity. You take an animal like the Caribbean monk seal, one of the more charismatic marine animals that was driven extinct. We can look at historical records. We arrive, and we start directly hunting the seals. Future extinctions get a bit more complicated. The major shift is that climate change is going to be a challenge in the oceans. We are making the oceans more acidic and warmer, and that's a new source of stress that these animals have to cope with. So, if their populations are getting low, they have to work though the process of adaption to a new environment. So much of the ocean is unexplored. How does that play into your research? The oceans are incredibly difficult places to study and understand. This is the reason why a report like this is new. We have been talking about these extinctions that are taking place on land, and the science is so much easier to document on land. Doing it in the ocean is a lot harder. First of all, this report is coming out a little late because of the challenges describing these patterns of change in the ocean. They can only be incomplete views. This is the best distillation of information from so many different sources, yet it remains a pretty incomplete view of what's happening out there with marine wildlife. What can we do to help preserve marine species? There are some big things and some small things. Put more parks in the ocean. Everybody knows that protected areas, parks on land, are the places you go to see wildlife. Marine wildlife also thrives in parks. We have far fewer protected areas in the oceans than we have on land. It doesn't help us to set aside space for wildlife if we are heating up that space and acidifying it. You don't think about a connection between what kind of miles-per-hour rating your car gets and oysters or tropical fish, but there is in fact a connection. Everything that we do in our daily lives to reduce carbon emissions is going to buy marine animals time. There are five trillion pieces of plastic in the oceans. The last thing I'd say is don't eat endangered wildlife. Use one of the smartphone applications to sort through your seafood section to figure out which are the rhinos of the sea. The global conveyer belt is part of the large-scale ocean circulation that is driven by differences in the density of the waters. It plays a key role in keeping the climate at balance and Europe warm. Global warming may change it forever with unforeseeable consequences. As climate change warms enormous portions of Earth, melting sea ice may actually cause Europe to become colder, a study has claimed. 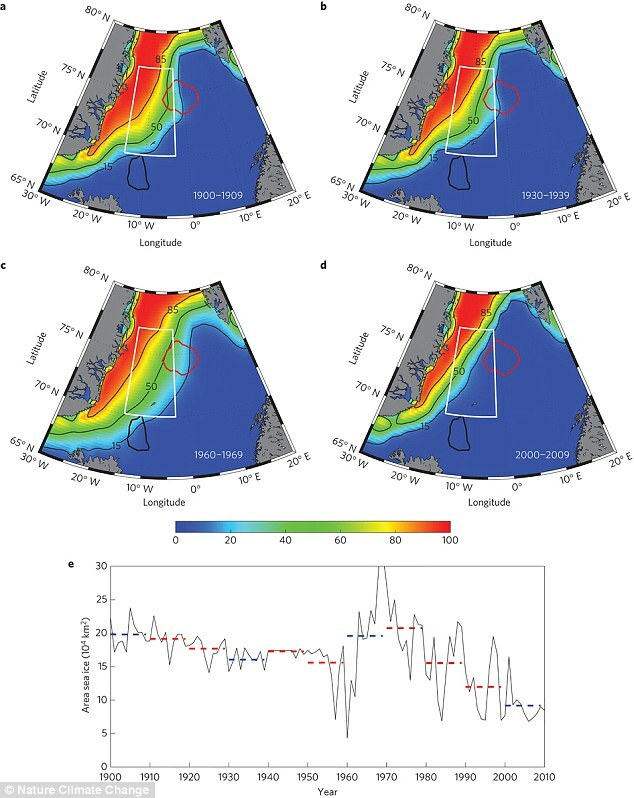 Over the past 30 years, ice levels in the Icelandic and Greenland seas - regions key to regulating Earth's climate system - have significantly reduced. Scientists believe that in turn this loss of ice will cause the flow of warmer water from the tropics to be affected, weakening the Gulf Stream and leading to cooler temperatures in Western Europe. 'A warm western Europe requires a cold North Atlantic Ocean, and the warming that the North Atlantic is now experiencing has the potential to result in a cooling over Western Europe,' said lead researcher Professor Kent Moore from University of Toronto Mississauga (UTM)'s Department of Chemical and Physical Sciences. Experts claim the disappearance of Arctic sea ice will lead to a reduction in cold, dense water - generated through a process known as oceanic convection - which flows south and feeds the Gulf Stream. If this convection decreases, the Gulf Stream may weaken, thereby reducing the warming of the atmosphere. The research, published in Nature Climate Change, is the first attempt to examine how changes in the air-sea heat exchange in the region are brought about by global warming. 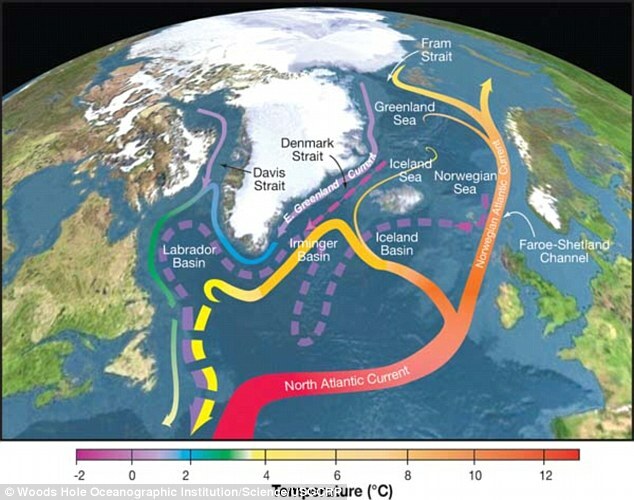 The research also marks the first time researchers have considered its possible impact on oceanic circulation, including the Atlantic Meridional Overturning Circulation (Amoc). The Atlantic Meridional Overturning Circulation (Amoc) is a major current in the Atlantic Ocean. A flow of warm, salty water travels north in the upper layers of the Atlantic, while a colder flow of water moves south in the deep Atlantic. Given its size and location on the planet, Amoc plays an important role in maintaining and controlling the Earth's climate system. This is because it moves a large amount of heat energy from the tropics to the Southern Hemisphere towards the North Atlantic. This heat is then transferred to the atmosphere and moderates the climate in this region. As the heat is transferred, the water becomes colder and more dense and this sinks and travels back to the south and eventually rises again in the tropics. 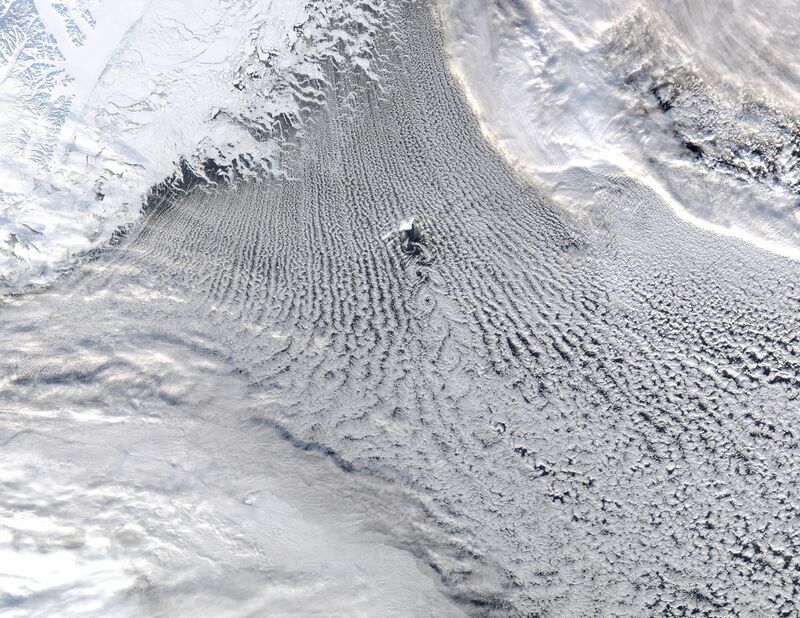 This transfer of heat - known as an air-sea heat exchange - occurs in the Iceland and Greenland seas where the conditions are ideal for this convection to happen. In particular, they each contain gyres that are shaped in such a way that make it easier for the hot water to rise and the cold water to sink in such a substantial way. As the sea ice decreases, the distance between these two gyres and edge of the ice becomes wider and reduces the maximum region where the heat exchange can take place. By studying data from between 1958 and 2014 taken from the European Centre for Medium-Range Weather Forecasts and model simulations, the researchers noticed this region is already 20 per cent smaller than 30 years ago. And if this decrease continues, they say it will weaken the overturning loop that feeds the North Icelandic Jet, thus reducing the supply of the densest water to the Amoc. The paper's other authors are Kjetil Vǻge from the University of Bergen, Robert Pickart from Woods Hole Oceanographic Institution and Ian Renfrew from the University of East Anglia. Land Information New Zealand (LINZ) has released updated nautical charts for Tauranga harbour to support recreational boating and shipping at one of the country’s biggest ports. LINZ Manager Chart Production Jennifer Ryan says the updated charts reflect updates to shoreline construction, changes to lights and other navigational aids, and undersea features. "Tauranga is New Zealand’s second largest port for container handling volume and significant changes in and around the harbour mean these charts will be a must have for skippers. 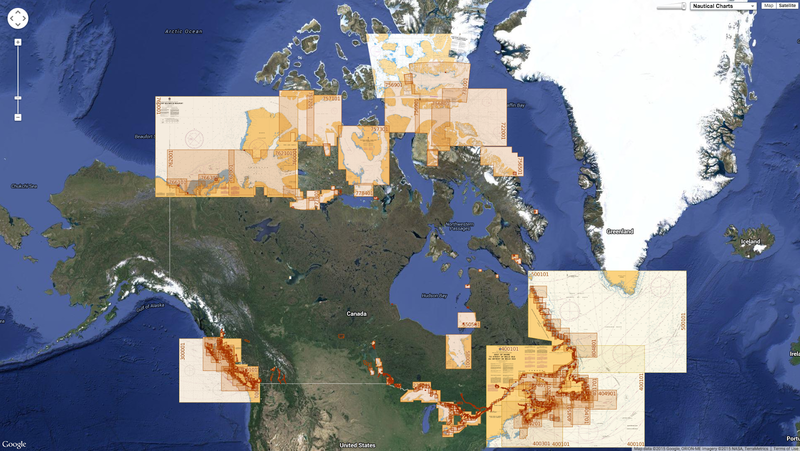 The updated charts reflect significant changes to navigational aids, new survey information in the upper and lower harbour, and amendments to the coastline and port infrastructure," says Jennifer. "Tauranga is also a popular spot with yachties and other recreational boaties, and these charts include details that will be useful for them. We’d urge any skipper operating in the area, whether professionally or for recreation to update their chart portfolio." Two charts for the Tauranga region, NZ 5411 – Tauranga Harbour Katikati Entrance to Mount Maunganui and NZ 5412 – Port of Tauranga are now available from approved retailers. keeping good time is becoming surprisingly complicated. Time will stop on June 30, but don't worry: It will only be for a second. Researchers will add a sliver of time—a leap second—to the world's clocks. at the German National Metrology Institute in northern Germany. Just as leap years keep our calendars lined up with Earth's revolution around the sun, leap seconds adjust for Earth's rotation. This kind of fine-tuning wasn't much of an issue before the invention of atomic clocks, whose ticks are defined by the cycling of atoms. Cesium-based clocks, one kind of atomic clock, measure the passage of time much more precisely than those based on the rotation of our planet, so adding a leap second allows astronomical time to catch up to atomic time. Most of us won't notice the addition, which happens at 23:59:59 coordinated universal time (UTC), or 7:59 p.m. ET, unless we deal in timescales shorter than a second, or if we use a computer program that crashes because it can't handle the leap second. It's happened before: The 2012 leap second brought down Reddit, Gawker Media, and Mozilla. "It's a major interruption mostly because there are a lot of systems that aren't prepared to handle the leap second correctly," says Judah Levine, a physicist at the National Institute of Standards and Technology (NIST) in Boulder, Colorado. Leap seconds occur irregularly, which makes it hard for programmers to test their fixes, he explains. about the relative locations of observing stations and about Earth’s rotation and orientation in space. Leap seconds don't come on a regular schedule because Earth's rotation varies, says Demetrios Matsakis, chief scientist for time services with the United States Naval Observatory in Washington D.C.
Our planet is slowing down, but it does so in unpredictable ways. So some periods require more leap seconds than others. The International Earth Rotation and Reference Systems Service continuously monitors our planet and will recommend adding leap seconds to the International Telecommunications Union (ITU). The ITU makes the ultimate decision on whether to add a leap second or not. Leap seconds were first introduced in 1972, and at that point, atomic clocks and astronomical clocks were already off by ten seconds, says Andrew Johnston, a geographer at Smithsonian's National Air and Space Museum in Washington D.C. So researchers added ten seconds all at once in 1972 to the world's astronomical clocks, he explains. Earth's rotation is a part of defining time. Leap seconds are added to our clocks to compensate for the Earth's slowing rotation. Levine is responsible for making sure the nation's timekeepers at NIST can handle the leap second. When it comes time to adjust their clock, NIST will transmit 23:59:59 UTC twice, Levine says. "Once when that time arrives, and once again for the leap second." So 6 p.m. mountain time—the NIST offices in Colorado are seven hours behind UTC—on June 30 will be stressful. "There's a full panic mode just before and after 6 p.m.," he says. Not everyone recognizes the leap second, although Apple does so on its devices. Google mobile devices sync with Internet time services that are usually tied to atomic clocks. But "if you have a standard Windows system, [it] just ignores the leap second," Levine says. Financial markets like the New York Stock Exchange also take the leap second into account. The exchange will close the market a half hour earlier than normal, at 7:30 p.m. ET on June 30, to help their systems deal with the addition. Navigation services, like the U.S. Global Positioning System (GPS), never use leap seconds, Levine says. That's because they need accurate measures of time in their calculations. If they stopped their internal clocks for the leap second, they would get inaccurate positions. The end-user isn't aware of this because the GPS system will still send information to the receivers we use—whether it's something we've picked up in an outdoor equipment store or our smartphones—about the leap second. So we'll see the correct time on our devices. But "true GPS time is off from civilian time by something like 16 seconds," says Levine. As GPS time is global time reference based on atomic clocks it has no leap second mechanism and as such the time offset between the GPS and UTC times frames will change with every leap second event that occurs. Since GPS time began on 1st January 1980 at 00:00:00 UTC, there have been 16 leap seconds applied to UTC to bring the time offset between the UTC and GPS time frames to 16 seconds. The next event in June this year will increase this time offset to 17 seconds. The leap second correction affects all GNSS receivers, software and correction services which have to compensate for the additional second in their output messages, clock synchronization and position computations. The headaches caused by the leap second have prompted some to recommend doing away with it all together. The organization responsible for deciding when to add a leap second has deferred making a decision on the issue but will discuss it again later this year, Levine says. The Smithsonian's Johnston is "agnostic" about the leap second, although he knows plenty of engineers who would love to do away with it. 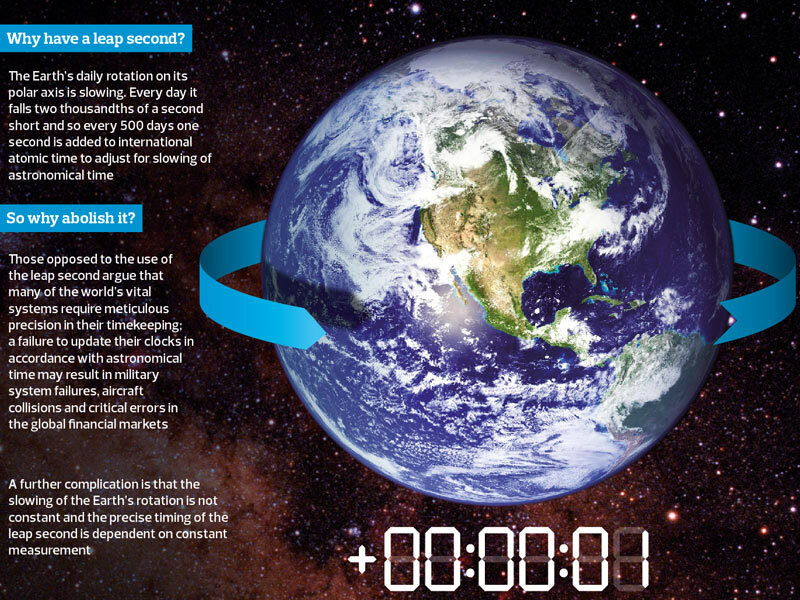 "But folks I know in the astronomy community would prefer to keep [leap seconds]," he says. "Things seem to be going the direction of stopping leap seconds," Johnston says. But people will have to wait and see what the International Telecommunications Union decides. "My personal preference is that we stop doing this business," says NIST's Levine. "The price for that would be atomic time would slowly walk away from astronomical time." But it would only be about a minute or two difference over a hundred years. Levine doesn't think that would be so bad. Doing away with the leap second "would make my life easier." and everybody actually tracking the leap second would in many ways be much much worse. Wired : What's the deal with leap seconds? The U.S. Executive Branch has declared that the cyber threat is one of the most serious economic and national security challenges we face as a nation, and that America’s economic prosperity in the 21st century will depend on effective cyber security. Before the maritime industry sounds the danger signal, it needs to monitor other industries and branches of the government and take proactive preventative measures. There is no better place to prepare future and current mariners for these challenges than in maritime simulators. With the advent of computers, network devices and telecommunications that make transport of data via radio frequency common place, it has opened a new world of vulnerabilities to hackers to tap, steal, destroy or alter data. This has led into a new area of potential maritime threats that go well beyond physical piracy such as the Maersk Alabama. With the recent GPS spoofing of a yacht by students at the University of Texas, the maritime sector has entered into a new arena that must be addressed as Maritime Cyber Security. The U.S., as a world leader and major target for terrorism in early 2013, through the Executive branch signed an Executive Order (EO) 13636 to Improve Critical Infrastructure (CI) cyber security and Presidential Policy Directive 21 – Critical Infrastructure Security and Resilience (PPD-21). It established an All Hazards approach to critical infrastructure security and resilience. The cyber security EO establishes a requirement for federal agencies to collaborate with their respective industry sectors to identify Critical Infrastructure that can be impacted by cyber activity. This initial foray by the federal government has led other departments and agencies to take initial steps to address the growing issues with cyber threats. The U.S. Department of Transportation, Maritime Administration (MARAD) being one of those proactive organizations has recently teamed with the Ship Operations Cooperative Program (SOCP) to cooperatively develop Information Systems Security Awareness Computer-Based Training (CBT) on cyber threats in the maritime environment. This is a first for the U.S. maritime community to recognize and take action to assist vessel owners and operators with training U.S. mariners on best practices to reduce the risks and vulnerability associated with information systems and devices. Newly developed cyber training will provide mariners with a comprehensive overview of the range of threats that information systems and devices are subject to, and the practices recommended to minimize those vulnerabilities. Best practices that are addressed in the training include a wide range of topics, from maintaining security for networks, to personal use of workplace computers, good password practices, and issues concerning the use of social media like Facebook and Twitter. This training also addresses issues for mariners working aboard vessels, such as specific log-in policies and rules surrounding working with sensitive information. Department of Homeland Security (DHS), through the United States Coast Guard (USCG), has also taken to task these growing threats and has determined that American ports, terminals, refineries, vessels and support industries are vital to the safekeeping of the nation’s infrastructure, security and our economy. 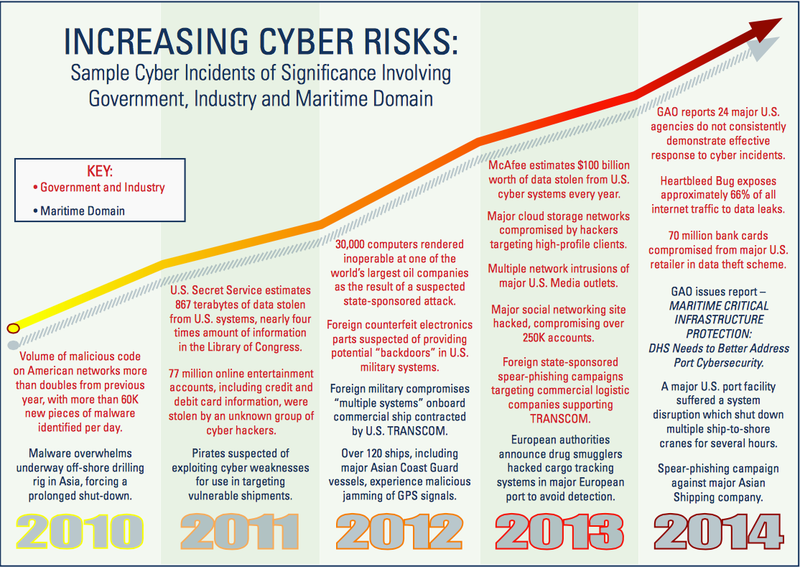 In short, there are as many potential avenues for cyber damage in the maritime sector as there are cyber systems. While only some cyber-attack scenarios in the maritime sector could credibly lead to a Transportation Security Incident, we must identify and prioritize those risks, take this threat seriously, and work together to improve defenses. Will the next hacker chess match take place on the high seas with oil tankers, container ships and other specialized vessels that transport approximately 90 percent of the goods moved around the world? Many devices are connected online which makes them more vulnerable to attack. As the maritime and offshore energy industries connect ships and oil rigs to computer networks, they expose considerable weaknesses that hackers can exploit. For example, it was discovered that pirates off the coast of Somalia and other key piracy areas hand pick their shipping targets by tracking online the navigation track of the vessel through AIS, ECDIS and radar. In the oil industry, hackers have committed much turmoil including the tilting of an oil rig, causing it to be shut down, as well as the penetration of the networked computing systems on another rig with malware that took trained personnel almost three weeks to clear. Other events have included smugglers hacking into networked systems to be able to locate containers with drug contraband and cleanly confiscate the drugs without being detected. They even went so far as attempting to delete the data for the shipment. While data on the extent of the maritime industry’s exposure to cyber-crime is hard to come by, a study of the related energy sector by insurance companies recently indicates that much of it maybe insurable. As the energy and oil industry has been targeted for some time, statistics are available that indicate this is already have a billion dollar impact on the world economy. In the maritime industry, the number of known incidents appears to be low due to either the companies being unaware of the cyber-attacks or because of the desire to keep such news from reaching the press with potential detrimental business impact to the company. There are few documented reports that hackers have compromised maritime cyber security. 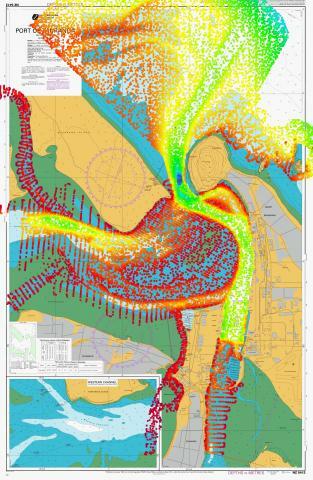 But scientists indicate they have determined areas in three key systems that mariners use to navigate: GPS, Automatic Identification System (AIS), and the system for viewing digital nautical charts Electronic Chart Display and Information System (ECDIS). Increasingly, the maritime domain and energy sector has turned to technology to improve production, cost and reduce delivery schedules. These technological changes have opened the door to emerging threats and vulnerabilities as equipment have become accessible to outside entities. As vessels continue to increase in size, the crewing continues to decrease, with the paramount shift in vessel operations, ship owners and yards have increasingly added more automation and remote monitoring systems to vessels. This has led to a dilemma, as more systems and devices on vessels might enhance productivity and safety on one hand, but on the other it presents more systems for hackers to compromise and control. It is fairly well-known that a significant proportion of computing and network devices are connected to the internet using serial ports with poor security. Devices range from simple traffic items such as stop light which have been proven that they can be controlled remotely by hackers, to complex items for the oil and gas industry that monitor and control oil rigs. It has been reported that some ships switch off their AIS systems when passing through waters where pirates are known to operate, or fake the data to make it seem they’re somewhere else. Some shipping companies are now taking cyber risks as true credible threats and taking necessary measures to beef up network and telecommunications security. Recent studies of U.S. ports have determined that very few have conducted cyber assessments and even fewer have developed a response plan. Very little federal money has been allocated to the maritime industry for cyber security projects or training. This lack of cyber security preparation by U.S. ports actually carries over to the shipping companies where it has been discovered that most have substantial security issues. However the good point is that the maritime industry has had limited compromising of its computing and network systems. This may be tied to the factor that they have not been a high priority and have not been on the radar screen of hackers. What should concern many in the maritime industry is that the main ship navigation systems including GPS, AIS and ECDIS receive data via radio frequency transmission at sea and as such are extremely vulnerable to hacking. AIS and ECDIS are now mandatory on larger commercial and passenger vessels per the recent IMO 2010 Manila Amendments. This new requirement has increased the need for shipping companies to come with security measures and protocols to protect these devices from intrusion by outside sources. It has also been known for some time that ECDIS systems and the required software update downloads can be compromised by hackers with severe repercussions. 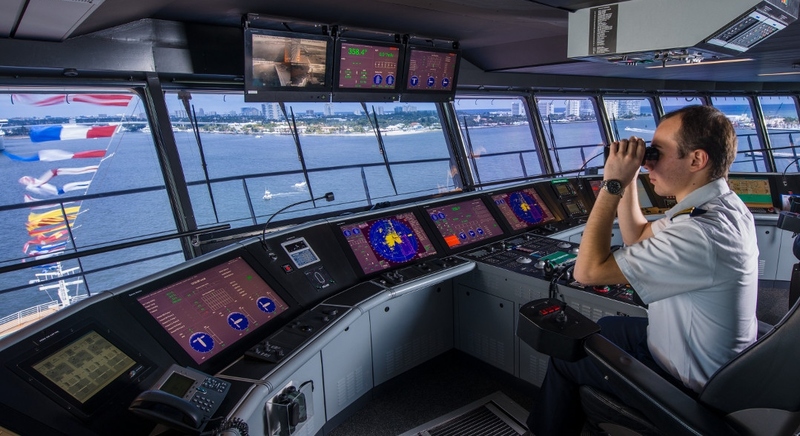 This came to light last year with the grounding of a U.S. naval vessel in the Pacific Ocean where it was reported that the ECDIS charts were incorrect and may have had an impact on the accident. A related discovery has been the widespread abuse of AIS by the maritime sector. Many ships deliberately transmit incorrect AIS position data attributable to security reasons in certain parts of the world including off the coast of Somalia, in the Caribbean smugglers do it to avoid tracking and arrest by law enforcement and even fishermen do it for financial gain by fishing in areas that are not permitted. Of paramount importance is the need for the maritime community to understand the principles of information systems and cyber security and it how it applies to on-board equipment before they can implement changes and conduct training so that personnel are aware and can act accordingly. There are many recent stories portending to GPS spoofing, including the June 2013 project at the University of Texas where they employed GPS spoofing as they hacked and manipulated the software to disorient the navigation system on a luxury yacht. Upon cloaking the device and transmitting the false signal, the yacht changed course abruptly when it received the false signal. Although this occurred because a system linked to the ECDIS handled the steering and not a helmsman, it still did happen. This opened up a new dilemma for the world for navigation on how to verify the accuracy and correctness of GPS signals. GPS has vulnerabilities that pose potential risks. In 2008 in response to presidential direction the U.S. government announced that they would establish a nationwide resilient terrestrial based system to augment GPS, and it would be named eLoran. This new system would build upon and modernize the old Loran-C system, while being less expensive to operate and be much more precise. The U.S. is not alone in recognizing GPS vulnerabilities; numerous other countries including most of Europe, India, Russia and China have installed or will install eLoran systems. Unfortunately the US government via the Department of Homeland Security had planned on dismantling the remains of the old LORAN-C infrastructure even though it is feasible to use it for the new eLoran. It was recently reported that prominent aids to navigation on the approach and within San Francisco harbor have now been added into the electronic aid to navigation (eATON) system. San Francisco has become the Beta port in the U.S. as it is the first one to begin using this unique system. This is not a costly process to implement as it does not require the U.S. Coast Guard to install electronic transmitters on the aids to navigation. Due to the fact that the aids to navigation are located in fixed positions in the ocean or on land or fixtures such as the Golden Gate Bridge, they have their own electronic identification assigned to them which is added into the Automatic Identification System (AIS). With the Golden Gate Bridge the center span is marked by a RACON, and the bridge towers are marked by eATON digital markers. This system in the San Francisco area is also being used in conjunction with reporting points in the Traffic Separation Scheme (TSS) including the San Francisco “SF” buoy that serves as the embarkation point for the Bar Pilots. It has been reported by the USCG that eATONs will not replace the actual physical navigation aids but will supplement the existing technology as well as add a virtual layer of aids to navigation in areas that previously were physically impossible to do or impractical in nature. 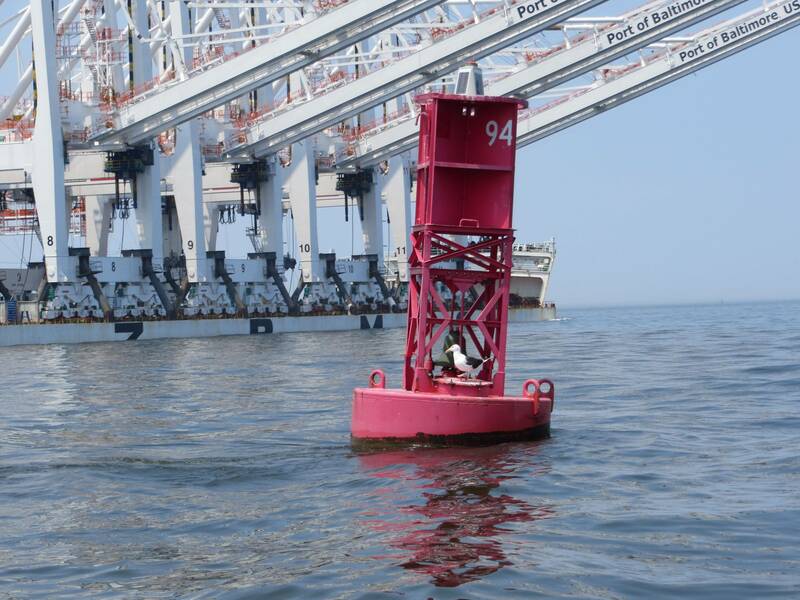 This now allows the USCG to place an eATON in the TSS where it was too deep before to do as well as mark a bridge tower that was practically needed most in reduced visibility not in day light. This technology eventually will allow the USCG to install transmitters on buoys so that the prudent mariner will be able to track where the buoy actually is as opposed to where it should be per a nautical chart. In a conflicting statement it was also recently reported that certain aids to navigation will be removed off the coast of California. This decision was tied to the presumption that all vessels are equipped with Electronics Chart Display and Identification System (ECDIS) which has been required by the IMO 2010 Manila Amendments to be installed on most vessels (tied to class and size) over a six year period starting in 2012. This could lead to disastrous consequences because a significant segment of the maritime industry including towing, fishing and recreational are not required to be ECDIS equipped. Additionally even for the blue water international commercial fleet reliance on ECDIS and GPS alone can be dangerous especially in light of the recent GPS spoofing phenomenon. Prudence and situational awareness dictates that the professional mariner needs to rely on visual aids to navigation within sight of land. Additionally what happens when you have an electronics failure and loose an ECDIS or both of them on a commercial vessel? It is thought that ECDIS has some underlying software security vulnerabilities that could lead to disastrous results for ships at sea. The basis of ECDIS is a navigation based charting system that use a computing system to digitally display nautical charts along with the exact location and track of own ship. This is a dramatic alternative and improvement to paper charts and the current system of hand plotting positions. ECDIS’s are installed on the bridge of a vessel and larger vessels are required to have two of them, one as a backup. When they are properly used with an ENC chart they can take the place of paper nautical charts. This is an increasing trend in the maritime industry. Where the problems arise is not when the ECDIS’s are in standalone mode but when they are networked together and when data is downloaded via an external source, whether through a USB port via a memory stick or via the net. Through the recently released IMO 2010 Manila Amendments regulations were implemented that now requires EDCIS to be installed on all commercial vessels of a certain size. This will slowly eliminate the reliance on paper charts and take the maritime industry on a journey into the electronic world where the next evolution will be the use of portable smart devices by navigators. Safe guards need to be put in place for ECDIS data updates as well as external security breaches when they are operated in a networked setting. When AIS is operated as intended it is a useful navigational aid that can be instrumental in collision avoidance. As has been published due to the configuration of the system much of the transmitted data can be manipulated or distorted. This has been confirmed recently by several sources including the Israeli’s. They have noted that vessels transmitting AIS spurious signals were nowhere near their actual location and on other occasions they also had phantom ships appear that could not be found. This system along with GPS and the recent spoofing episode needs to be enhanced to include some type of signal authentication process so that erroneous signals will not be displayed. Smart ships are on the horizon and it has been predicted between 2020 and 2030 that we will see such a ship going about its normal business at sea without a crew and being totally monitored from shore. Shipyards are already constructing vessels that are fully sensored so that they can be monitored after it is delivered and while it is at sea for maintenance and servicing purposes. These vessels can take two forms either autonomous or unmanned. Autonomous is defined as a vessel primarily guided by automated on-board decision systems but controlled by a remote operator in a shore based control facility. Unmanned is one step beyond autonomous and is totally controlled from a shore based control station. Key features would be the standard maritime policy of having redundant systems and emergency backups on board. Where does this new technology take us in the maritime simulation world? Possibly as is done with USAF we will have ship drone training and certification. This could tie into the scenario with a fully integrated navigation suite of GPS, eLORAN, EATON and a digital visual sensor system that can be fully controlled and monitored 24/7/365. Maritime simulation is important as it imitates the operation of a real-world vessel in a safe environment. The act of simulating cyber threats and scenarios will allow us to focus on these new cases of spoofing and jamming through the mariner’s heavy reliance on Radio Frequency (RF) transmissions that can potentially be comprised. Simulation can be used to show the eventual real effects of alternative conditions and courses of action on the vessel. Simulation is of utmost importance specifically where we need to interact in congested waterways, narrow channels, dense traffic and many other restrictions including dangerous cargoes. What simulation will allow us to do is introduce many of these potential cyber threats in a real life environment and let the mariner interact with the exercise and respond in real time. In developing the next wave of maritime education it is a logical evolution to go beyond Vessel Security Officer (VSO) and create a new role for a Vessel Cyber Security Officer (VCSO) in a Maritime Cyber Security (MCS) program. This position could be an extension of the VSO or a new certification. In either direction it is necessary to have crew members with these skill sets who can act as the responsible officer(s) on each ship. As the go to personnel, they would be responsible for all levels and details of cyber security and defense. Through the recently released STCW 2010 Amendments IMO has already proactively moved forward with the introduction of the Electro Technical Officer (ETO) and an Electro Technical Rating (ETR). How does the industry move forward and get to that logical level of training and preparedness? First it needs to review existing maritime simulation to determine the equipment and systems we are using. Next step is determine how they are integrated, as well as built-in security in place. From this we can start the journey on determining how cyber threats could attack, destroy or disable the equipment … or in the worst case scenario … take command of it. In the end it is through the awareness training and education that mariners will be able to thwart these infiltrations. Another source of mariner awareness and training must be the use of the internet and the download of potentially corrupt data through viruses, worms, phishing, spoofing and hacking. This may happen due to improper or lack of training or some circumstances an oversight due to fatigue but nevertheless it must be avoided. A similar path applies to the use of vessel email and the threat of receiving spear phishing emails purported from reliable sources with click-able links to websites that are fraudulent and will take control of your computer back door or install a virus. In summary as we move forward we need to incorporate in the syllabi of all maritime simulation courses the basics of Maritime Cyber Security (MCS) as it is and ever present threat that will not go away. It is only through diligence and proper training and awareness that seagoing mariners will be prepared and ready to take appropriate actions when warranted. Marine Electronics & Com : Are shipowners ready to prevent cyber attacks?